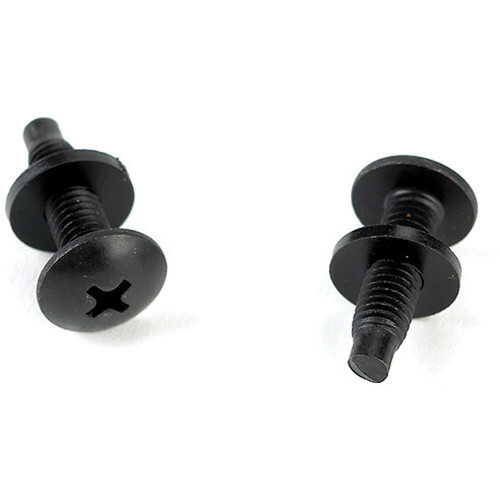 The black, pack of 50 Raxxess PTSW050 Rack Screws and Washers are used to prevent scratching equipment. Box Dimensions (LxWxH) 2.9 x 2.9 x 1.3"
PTSW050 Rack Screws and Washers (Pack of 50) is rated 4.9 out of 5 by 10. Rated 5 out of 5 by Anonymous from Wonderful screws... You can screw them. Rated 5 out of 5 by David from Very good quality These were so much better than the screws an bushings that came with my rack that I took all of those out and replaced them with these. The bushings are particularly sturdy. They don’t carve apart when righting them like others I’ve used. Rated 5 out of 5 by Dominick from Good quality Much better quality than the screws I received with my Odyssey rack mount enclosure. Definitely recommended. Rated 4 out of 5 by KC7HP from Fine for normal installation but seems a little soft Rather than cats and dogs from my hardware stash, I bought "official" mounting screws for my project with 10U worth of rack.? I ordered one pack to mount everything, including? a couple screws marred by the Phillips head stripping.? This is due to extra force needed for initial assembly into rails bolted to a wood frame that sits in a (well ventilated) cubby.? Some screws had to be torqued with the driver at an angle.? So, the heads seemed a little soft, won't really be a problem for "normal" installs but indicative that these are probably not the best for repeated installs/removals.? The unthreaded leader was nice for getting all the gear attached and jiggled into alignment.? Screw length was rather long for the thin faceplates of my networking gear.? Bearable for the first pass, but felt rather tedious in the redo for switching positions of a couple plates for 'best' layout. (I use a manual screwdriver and press hard with the other hand to avoid stripping.? It is a lot like doing your isometrics.) Conclusion: ? Like the uniform appearance with 50 of the same part, and the large head, plastic washer look good for the application. ?Like the installation with normal tolerance. ?Half-like for installation with tight tolerance. Rated 5 out of 5 by K9GP from Nice screws These are perfect for my application! Rated 5 out of 5 by rcf3r from Great rack screws High quality screws!